No matter the time of year, little hands (and maybe not-so-little hands) get into everything. Whether you’re in a restaurant, on a long car ride, or just walking through a supermarket, it’s usually a good idea to put something into those active hands to keep them occupied before they get too active (or maybe just get on your nerves). Got a really little one? 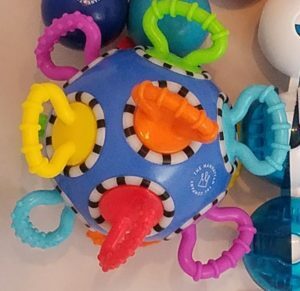 This brightly colored, plastic ball with many handles to twist and turn is a great option. It’s also easy to connect to a baby stroller or seat so your kiddo won’t be able to toss it onto any dirty floors (as we all know they so love to do). As the name implies, the Click Clack makes sounds when baby turns the handles, and it rattles as it moves. 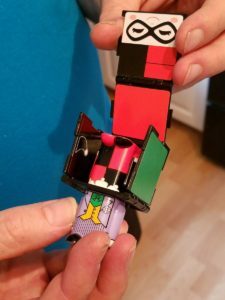 It’s filled with tiny beads, which make lots of stimulating noise (but not so much that it will drive mom and dad crazy). An excellent choice for baby showers, too. Retail prices vary from $9.99 to $15.99 depending on where you buy, so get your Google on before you shop. Another great manipulative from Manhattan Toy. There’s a reason these baby beads have such staying power. 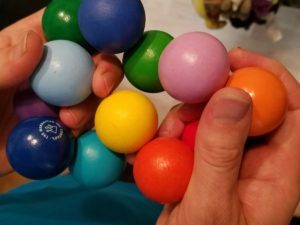 Your baby (and toddler, and maybe even one or two of the adults around the house) will enjoy twisting and turning and rolling these wooden beads. 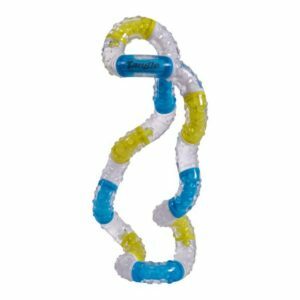 The bright, colored beads are non-toxic, so no worries if your little one chews on them. But the fun goes far beyond chewing. These beads will keep those fingers busy and the gentle clicking when the beads touch will entertain the ears. These Classic Baby Beads retail for $9.99 to $16 in different stores, so check online first to get the best price. 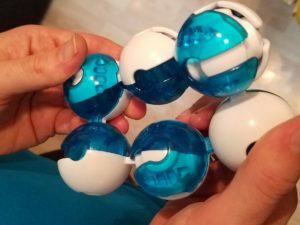 This entry was posted in Reviews and tagged manhattan toy, tangle, tastemakers, think fun on June 1, 2018 by Parents@Play Team.